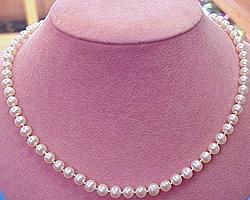 Lovely fresh water pearl strand, our pearls measure 5.5mm width, and come in 18 inch length. 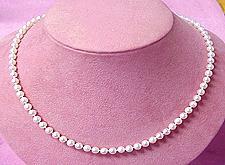 These are very nice white solid nacred pearls, comes with our 14K gold clasp. 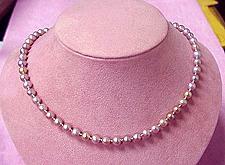 5mm fresh water pearl strand, 18 inch in length. 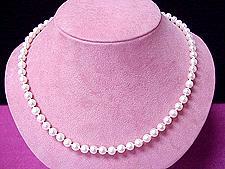 These cultured pearls are indestructible and maintain their luster forever. Comes with our 14K gold clasp. 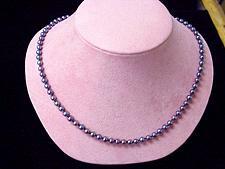 5mm Chinese salt water pearl 18 inch strand. 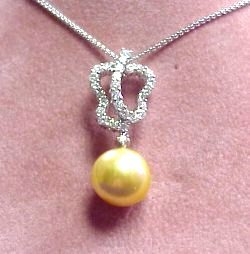 Beautiful 18 inch fresh water white pencil pearl necklace...Each pearl is unique in shape, color, and individually knotted and finished with a 14K gold clasp. 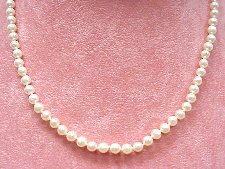 SAVE $$$ with our popular 6mm fresh water pearl strand, each pearl is void of any ugly imperfections and individually knotted on silk. 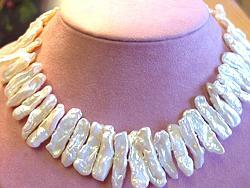 The nacre on these pearls will never crack or chip...each strand comes in 18 inch length. 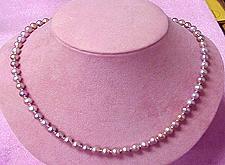 Comes finished with a 14K gold pearl clasp. 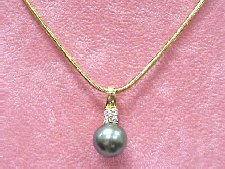 Japanese Akoya pearl strand comes with 7mm width gorgeously toned violet pearls and strung on silk to a 28 inch overall length with our DiamondsHere fancy 14K gold clasp! 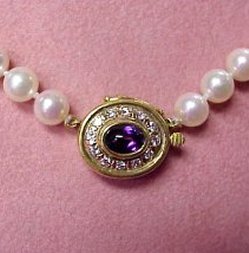 Beautiful 18 inch x 7mm width Japanese akoya pearls in rich violet color (dyed), our strand is individually knotted in silk with our 14K gold clasp! 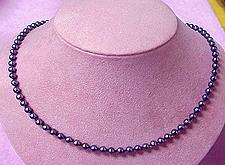 6mm cultured freshwater pearl strand, 18 inches in overall length. Comes with a beautiful solid 14K safety clasp.